The Marants model 125 is a high quality Tuner employing some of the latest advances in Tuner technology: Dual Gate FET RF Amplifier and mixer, phase linear IF filters, phase locked loop multiplexing, and 3 levels of muting based on signal strength., noise level and tuning. All muting functions are performed by a muting IC which replaces the discrete Components employed in other Marantz tuners and receivers. 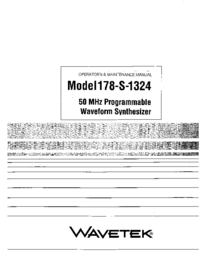 TABLE OF CONTENTS INTRODUCTION ... 1 AM TV Multimedia">Tuner ... 1 FM TV Multimedia">Tuner ... 3 TEST EQUIPMENT REQUIRED FOR SERVICING ... 6 PARTS LIST ... 19 TECHNICAL SPECIFICATIONS ... 27 SERVICE INFORMATION FOR EUROPEAN MODEL ... 28 This service manual was prepared for use by Authorized Warranty Stations and contains service information for the Marantz model 125 Stereophonic TV Multimedia">Tuner. 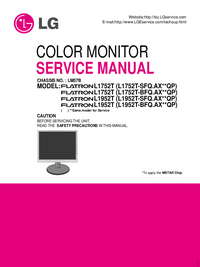 Servicing information and voltage data included in this manual are intended for use by the knowledgeable and experienced technician only. All instructions should be read carefully. No attempt should be made to proceed without a good understanding of TV Multimedia">Tuner operation. 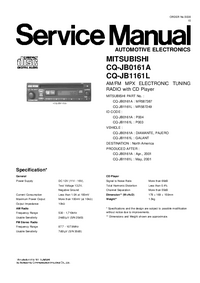 The parts list contains complete parts replacement information. 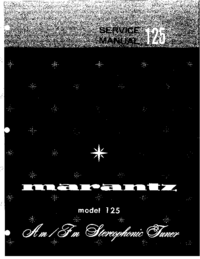 Most replacement parts should be ordered from the Marantz Company. However, a simple description is included for parts which can be obtained locally.